Boeing has suspended deliveries of its new 787 Dreamliner aircraft until a battery problem is resolved. An email from the US aerospace giant said it would continue to build the plane, but not deliver any until US safety officials gave their backing. The Federal Aviation Administration has joined the Dreamliner investigation. All 50 of Boeing's 787s have been suspended from flying since an All Nippon Airways flight on Wednesday made an emergency landing due to a fault. "We will not deliver 787s until the FAA [Federal Aviation Administration] approves a means of compliance with their recent Airworthiness Directive concerning batteries and the approved approach has been implemented," said a Boeing spokesman in an email. 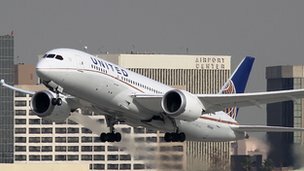 US Transportation Secretary Ray LaHood said earlier the Dreamliner would not fly again under authorities were "1,000% sure" it is safe. A string of issues in recent weeks has raised questions about the 787, which is the first major aircraft grounding since 1979. Dreamliners have suffered incidents including fuel leaks, a cracked cockpit window, brake problems and an electrical fire. However, it is the battery problems that have caused the most concern. This week, US and European aviation regulators said planes should be grounded while safety checks are carried out on their lithium ion batteries. On Friday, US officials from the Federal Aviation Administration and the National Transportation Safety Board joined the Japanese probe at Takamatsu airport in western Japan. The Japan Transport Safety Board said the battery and the systems around it would be sent to Tokyo for more checks, adding there were similarities with an earlier battery fire on a 787 in Boston operated by Japan Airlines. The pilot of the ANA plane made an emergency landing on Wednesday after he smelled burning and received a cockpit warning of battery problems. All passengers evacuated the plane on emergency slides. The investigation is being led by the Japan Transport Safety Board. Boeing is investing heavily in the 787 Dreamliner, and needs to sell 1,100 over the next decade to break even. It has stood by the integrity of the Dreamliner, which has been in service since October 2011. Together with European rival Airbus, it dominates the global airliner market.